A solution to Auckland’s land shortage? February 11, 2019 February 2019 Comments Off on A solution to Auckland’s land shortage? Auckland’s golf courses are huge tracts of heavily subsidised central Auckland land lying vacant in the middle of a housing crisis. There are 39 golf courses, 14 of them publicly owned. Many Auckland Council-owned golf courses – including Remuera and Waitemata – are paying $1 a year in rent, despite charging annual fees in excess of $3000 and $1300 respectively. Both are taking up tens of millions of dollars of prime housing land in central suburbs near major transport links. Alpha will start on Wednesday 13th February at 6:30pm at St Andrew’s church hall, 41 Dublin Street, Martinborough. Transport themselves from A to B. 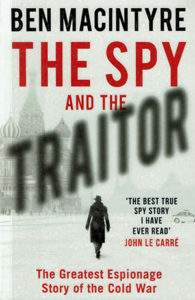 The blurb on the cover of this just published book is a quote from John Le Carre ; “The best true spy story I have ever read.” Praise indeed, but not unwarranted. This book is really fascinating. Set during the height of the Cold War with Thatcher, Regan and Gorbachev in untrusting power and each having vast spy networks operating. While each country’s secret service was extremely good at spying they strangely failed spectacularly when it came to monitoring their own members. Erroneously preferring to believe that their rigorous recruitment processes ensured trustworthy staff. The result being that each had highly placed super traitors working quite freely within.